Our new mobile flotation unit! 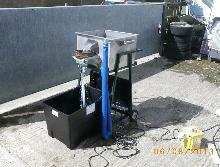 We are now able to offer on-site flotation with our new mobile system. Save on transportation and storage of heavy soil samples. NB: This facility will also offer you the opportunity to evaluate, assess and re-assess your sampling strategy whilst on site. Using the Dinolite Hand Held USB Microscope, we can take detailed photographs of anything unusual or interesting we find in your flots or residues and email them straight to you! 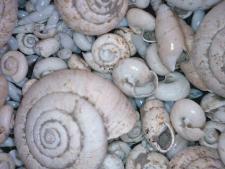 Part of the mollusc assemblage in soil samples from a Saxon site. Rare Saxon bone comb and worked flint tool found in the residue of soil samples from a Saxon sunken building in Lambourn. Refloating soil samples is a very effective way of retrieving the maximum amount of material from your soil samples in a quick, efficient and cost-effective way. Refloating can double the amount of charcoal that can be retrieved from soil samples. If soil samples were taken and stored in wet conditions, charocal can become waterlogged and reluctant to float. Certain types of weed seeds and chaff can also be less buoyant in the water than other types of plant macrofossils. Refloating can bring to the surface a completely different range of material than the initial float, and so provides a more complete picture of environmental material in the sample. With just one float, the results can be biased towards that material which is drier and floats more readily than other carbonised plant remains. 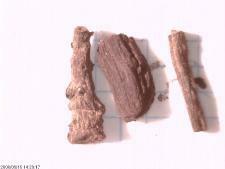 The photographs below show the amount of material retrieved from one sample. Left is the initial float and right is the refloat. Please contact us at info@geoflo.co.uk for pricing of refloats. Although the primary function of flotation is the retrieval of environmental material, it can also be used very effectively for retrieving particularly delicate or fragile artefacts from bulk samples. The photographs below show Beaker pottery which was too fragile to be excavated in the conventional manner. Bulk samples were deliberately taken to include the pottery sherds, which could then be separted from the soil by gentle washing in the flotation tank. Bulk samples taken for the recovery of cremated human bone can be processed by flotation to recover cremated human bone and charred plant remains/charcoal relating to pyre technology and cremation burial practice. Residues are air-dried, fractionated and sorted for cremated bone, charcoal and charred plant remains.